This article submitted by Linda Stelling on 10/25/00. A personal challenge got Pieper Fleck interested and eventually excited about Scandinavian art. Her only art training before 1994 was what she had learned in high school and a class in Bavarian tole art she had taken to learn more about the style because she thought it was so decorative. Fleck with a sample of her Swedish Dala painting. The painting tells a story using people and animals. Her friends suggested she try rosemaling. "I grew up seeing rosemaling but I didn't think I could ever do it," Fleck said. In 1997, Fleck received her first formal art instruction in Scandinavian art. She took a class at the Vesterheim Museum in Decorah, Iowa. "A whole new world of Scandinavian traditions opened up to me," she said. According to Fleck, the Vesterheim is considered the meca of Scandinavian traditional folk art. The museum houses the largest collection of immigrant art in the country. While at Vesterheim, Fleck met Karen Jenson of Milan, Minn., and fell in love with her style of painting. A professional painter for 35 years, Jenson is a gold medal award winner for rosemaling. Jenson now teaches rosemaling at the Village Art School in Milan. 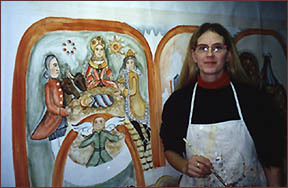 Besides Scandinavian rosemaling, she also teaches Norwegian rosemaling. Jenson also teaches Swedish dala painting style. During one of Jenson's classes, Fleck was looking at some books and asked if what she was looking at was Swedish. Karen Jensen's answer was "no!" "Here I am Swedish and the paintings I thought were my heritage turned out to be Norwegian," Fleck said. "I wanted to learn more about the Swedish styles," she added. The Swedes developed their style from 1750 to 1850. "It is important that Swedes recognize their art style," Fleck said. Fleck has taken classes from Jenson at her home in Milan for three years now. This last year Fleck applied for and received an apprenticeship from the North Dakota Arts Council to work one on one with Jenson. "The arts council liked what they saw in my work," Fleck said. An apprenticeship is the only way a master artist can pass on an art and keep the tradition going. "It is my hope to keep that tradition of Swedish dala painting alive," Fleck said. According to Fleck, there are about as many Swedes as Norwegians in Minnesota and North Dakota. Everybody sees their art, but it is also important to know the difference between the two. The Norwegian rosemaling includes more scroll work and flowers. Swedish dala painting tells a story using people and animals. In the 1750s, dala painting was painted on walls of homes. The stories were often Biblical or of the family. In the dala paintings, Kurbitz flowers are found in all the art work. The flowers can be found hanging or curving over people to protect them. Fleck said the Swedes do most of their paintings on canvas while the Norwegians painted on furniture. There is also a difference between the art of southern Swedes and those living in the north. Fleck explained the southern Swedes painted on tapestry, telling stories in a sequence of frames. They did not use Kurbitz either. Flowers were used to fill in empty spaces. The Swedish painting called "Grandma's Garden" is one of Pieper's favorite ones. According to Fleck the tapestries were not hung on walls for all to see, but rolled up and stored. They were brought out on special occasions like weddings, holidays, or anniversaries. "They didn't have Christmas trees, they gathered around the tapestries," Fleck said. "Only the wealthy families had them." 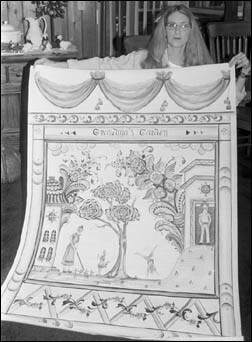 As part of her apprenticeship, Fleck is painting an 18-foot tapestry for her home. She is utilizing a southern Swedish style, depicting a Christmas story in a framed sequence. Fleck plans on displaying this painting in her "Swedish Room" in her house in Grand Forks. "This will be permanently displayed and not put away," she said. It took Fleck a full day to pencil sketch her idea onto canvas. She has spent about an equivalent of five days painting the characters, using a thin acrylic paint. "It doesn't take long to do something once I get started," Fleck said. "I have my magic brush made of pig bristles," Fleck said. She used to joke with Jenson about having magic paint brushes. Then Jenson recommended she try painting with a certain type of brush (pig bristle) "I didn't think much of her brushes until I tried them," she said. Now Fleck says she has her own magic brushes. "They get more magic the more I use them," she added. Fleck just finished painting 22 shutters on her parent's home in Regal. "I did them all in one day," she said. She used the same flower pattern on all the shutters. "I painted the shutters between taking the kids to gymnastics and lunch," she joked. Her mother, Janet Fleck, is remodeling her dining room and kitchen. 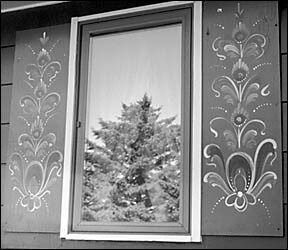 Fleck will be dala painting around the dining room window. They haven't decided whether to rosemal the present cupboards or get different cupboards to decorate. Each artist has their own style and color. Fleck said she wants to be true to the classic designs but needs to maintain her own style. Fleck is the only artist in North Dakota doing this style of folk art. The North Dakota Arts Council is encouraging her to do another apprenticeship. "I took water color and acrylic painting in high school, Fleck said. However, Fleck didn't find her artistic niche until she learned Swedish folk art. "I'm more comfortable doing primitive art. I have problems with letters and people are harder," she added. One of her favorite paintings is "Grandma's Garden." It depicts her in-laws, John and Etta Wittgraf in their yard with her two daughters, who are playing. Fleck explained that since the northern Swedes lived in a remote area, isolated from people, they painted people from other parts of the world in their own style of clothing. Thus she depicted the Wittgrafs in more traditional clothing. The Swedes from the south were influenced a lot by sailors and traders who stopped at the harbors. Fleck enjoys being able to turn something not so attractive into something attractive.